This lotion contains Goat’s Milk, Honey and Shea Butter. Goat’s milk is high in protein, triglycerides, Vitamin A, B6, B12 and E making it an excellent natural moisturizer that helps hydrate and nourish skin. Honey is a natural anti oxidant and anti-inflammatory. It is high in vitamin C and promotes collagen formation in the skin. Shea Butter is well known in helping moisturize while providing a silky protective barrier to all skin types. Does not contain mineral oil. Contains Goat’s Milk, Honey and Shea Butter. Goat’s milk is high in protein, triglycerides, Vitamin A, B6, B12 and E making it an excellent natural moisturizer that helps hydrate and nourish skin. Honey is a natural anti oxidant and anti-inflammatory. Shea is well known in helping moisturize. Water, Glyceryl Stearate, Isopropyl Myristate, Caprylic/Capric Glycerides, Stearic Acid, Ceteryl Alcohol and Ceteareth-20, Stearyl Alcohol, Soybean Oil, Shea Butter, Dimethicone, Sunflower Oil, Aloe Barbadensis Leaf Juice, Goat Milk Extract, Hydroxyypropyl Trimonium Honey, Methylparaben, Propylparaben, DMDM Hydantoin, Triisopropanolamine, Disodium EDTA. COMMENTS: My customers live this as a hand lotion. COMMENTS: i bought this to make my grandson lotion as he has skin issues.Needless to say a gallon will not be lasting anytime here.Everyone wants lotion.This stuff is the bomb!It leaves your skin so silky and soft.Just starting a soap business I am excited and glad I made this purchase. • So easy to add to. • Leaves your skin so soft and silky. COMMENTS: My customers go crazy for the lotion base! I love it too! Creamy and not greasy. Holds scent and color well. I love it! COMMENTS: This is a really nice lotion base! I make a goat's milk lotion from scratch for me & my husband, but sometimes I just don't feel up to the task. When my husband came to me asking for a refill of his lotion, I picked up some of this base instead & he hasn't said a word! I don't think he can tell a difference, which is great because it feels really nice on the skin & saved me a ton of time! This lotion base has a great consistency! Once fragrance was added at 3%, it was the perfect consistency that works well in both jars & pump bottles, as my husband prefers jars, but I prefer to use a pump bottle (not too thick, not too thin, it's just right)! It feels rich & creamy, moisturizes the skin very well, and absorbs quickly. The base also accepts fragrance wonderfully, and hydrated skin is enjoyed for a very long time after applying. With how easy this base was to work with & how much time it saved me, I really think this will be my "go-to" base every time my husband asks for a lotion refill! • Feels great on the skin! COMMENTS: My customers and I love this lotion. So easy to scent and sell.... I will continue to order this for a long, long time. • It soaks into skin beautifully. COMMENTS: Perfect consistency, been using it for years. Everyone loves this! COMMENTS: This is my favorite lotion. I have tried to make lotion but it did not turn out and I wanted to add it to my line, so I tried this lotion and loved it, no greasy feeling. Easy to use. "Great lotion! Described exactly how it feels "
COMMENTS: Will definitely be ordering more, so far customers are loving it! Feels very silky & great moisturizer! COMMENTS: Great absorption. Receives scent well. COMMENTS: i made lotion with this product. added my essential oils and these are huge sellers. COMMENTS: This lotion base is amazing on it's own or with fragrance added to it, it leaves skin feeling silky smooth and definitely great for dry/sensitive skin. • Nothing, great as is. COMMENTS: This cream lotion needs to get into more hands. Shoppers are shocked when they use it. I've even had several shoppers leave the store and come back because it was so soothing on their hands. Love the stuff!! COMMENTS: Woooooow weeeeeeeee!!!!! Deliciousness packaged in this jar!!!!!! Silky, soft, gentle, light!!!!!! What more can I say? Get it!!! COMMENTS: I made some of the most lovely lotions with this base and the feel of it last all day it is so smooth and moisturizing I just love it. COMMENTS: This is a wonderful lotion. It feels so good going on, very creamy and cushiony and so soft! It soaks into your skin very quickly and leaves you soft and moisturized. I'm so glad I decided to try this base, my testers all love it and so do I! I will for sure be buying more. Every base I have tried from WSP has been very top of the line quality. COMMENTS: This lotion holds scent well and is a favorite. Great product. COMMENTS: We have always made our lotions from scratch. Our exploding business made buying this lotion a must this season and we were not disappointed in the slightest! The quality is fantastic and it leaves the skin SO soft! I would HIGHLY recommend this lotion - it is easily scented and packaged and the quality is consistent and FANTASTIC. BUY IT. "Will keep on the shelves"
COMMENTS: I have tried so hard to come up with a goat milk lotion recipe, and have failed. I finally got this, and do not regret it one bit!!!! I LOVE this lotion...and I am very picky about my lotion. I sold it for the first time this past weekend, and it flew off the shelves. I'm soooo glad this is available!!! COMMENTS: worked great wit ha clean scent. COMMENTS: This product is awesome. My customers (and myself!) love this product. It is very easy to work with and smells great just by itself without fragrance added. It goes on smooth and doesn’t leave a greasy residue on your hands or body. I use this product regularly once I get out of the shower. I bought one pail at first to test it out and it FLEW off the shelf! So I recently bought another 4 pails to fill current orders. You will not be disappointed with this product. COMMENTS: I have had to reorder this a few times, it does an amazing job and my customers love it..I love it! COMMENTS: Love this product! Great for providing samples of our body butters. COMMENTS: This lotion is amazing. I simply can't make it fast enough for my clients. It has a great moisturizing effect without leaving the skin feeling greasy. It holds fragrance well. I used to have "chalk elbows" prior to using this product and now that is gone. I share that fact with my clients and it has become my biggest selling point. Thank you for making such a wonderful product. COMMENTS: I scented this lotion with a Honey FO and my customers love it. It goes on smoothly and feels silky on the skin. Will continue to buy. COMMENTS: Great lotion base. Goes on very smooth and is not greasy or sticky. Compared to many high end department store brands this one hold its own. Will be a staple in my product line. COMMENTS: The lotions are wonderful! The leave your skin soft not greasy. I have had a lot of compliments from customers! "Goat Milk & Honey Base"
COMMENTS: Love this lotion. Great silky feel and absorption. Not too happy about the price increase. COMMENTS: This is a wonderful lotion. Its not greasy but feels silky. My customers love it. COMMENTS: I really liked how smoothly this lotion went on. I want to try the paraben free version. I loved how my skin did not feel greasy after applying like a lot of commercial lotions do. COMMENTS: Easy to work with, fragrances blend nicely and consumers love the finished product. COMMENTS: This body lotion is amazing. Love how the application is effortless - smooth, absorbs quickly into skin. Best of all, my skin does not feel greasy. Will definitely be reordering. COMMENTS: I bought this as a kit for my daughter and she loves it. COMMENTS: This is the most amazing lotion base! I purchased the sample lotion pack and a 16oz of the goat milk & honey. It is hands down my favorite of all of them. I added orange essential oil to it, but it really smells good without adding anything. Will definitely be my go to lotion base. "Goat Milk and Honey Lotion Base"
COMMENTS: So easy to use and fun! Love how soft and non greasy. COMMENTS: Smooth, creamy and absorbed quick. Easy to work with and customers loved the feel of the lotion. "Goat Milk Honey Lotion Base"
COMMENTS: I love this product nice creamy consistency, but not greasy. I'm short of time getting ready for a show and I love how easy it is to customize. Will be buying again. "Goat Milk and Honey Lotion"
COMMENTS: This lotion has boosted the sales of my business since I have added this to my product line. I have incorporated fragrance oils as well as essential oils into the scent lines. Customers have been extremely satisfied with this lotion and get in touch with me right away if they are ready to run out! COMMENTS: It is AMAZING! Leaves your skin so soft and not greasy at all. People love this lotion. COMMENTS: This is an amazing product! Very easy to use and my customers love it! COMMENTS: Easy to uses and add fragrance and color if you want and bottle it! A nice lotion to use. Will be buying more. COMMENTS: Absolutely amazing lotion. Soaks in skin nicely. Works well with or cp soaps. COMMENTS: Very Creamy and soaks in your skin beautifully! COMMENTS: In love the way this lotion base feels. Light not greasy. Holds scent and colorant well. Becoming a popular seller for me. COMMENTS: This is a great lotion!!! Easy to use!! COMMENTS: My customers love this. I mix some items into it to make it work best for me. They love the feel. COMMENTS: I have a large "must be goat's milk" crowd and they are loving this lotion. I have samples out and once they try a sample, they buy a bottle, usually more than one. It behaves well when adding fragrance. I do not add color. COMMENTS: This body butter is amazing so smooth and silky, absorbs right into my skin and "no" greasy feeling what so ever. I love it ..
"Love this creamy lotion base!" COMMENTS: I can't keep this in stock! My customers love how soft and silky the lotion makes their skin feel. It's also very thick so a little goes a long way making it a great bargain. It's also so easy to heat up and blend in my fragrance and color. I even make an unscented one with added oatmeal protein for extra sensitive skin. The base is also creamy white and odorless so takes scent and color very well. I've been using this lotion for a couple of years now and absolutely love it! COMMENTS: My Customers go nuts for this lotion because it is non greasy and keeps skin soft and smooth all day long. I whip in a tiny amount of melted Mango Butter for even better skin sinkability. The cream is versatile. Light enough for a face and neck cream, sturdy enough for a body butter. Use your imagination. COMMENTS: Sell out every time! COMMENTS: Thick, rich and luxurious. Great ingredients and nothing you don't want in there. I'm proud to stand behind my body butter and happy that I don't have to create this base from scratch. COMMENTS: My very favorite lotion base. COMMENTS: I've been buying this lotion base for a very long time. My customers love it, either scented or unscented! I love the way it feels once I rub it into my skin. Leaves a silky feel, not a greasy, sticky feel. COMMENTS: My favorite lotion by far....it is buttery, silky, not greasy and my psoraisis is calmed by it. I add a bit of colloidial oatmeal and another butter to it like 1%. It is thick like a butter...I have nothing negative to say. COMMENTS: I love this base. Accepts additives nicely and doesn't thin out. Dries smooth. COMMENTS: This is my go-to lotion base from now on. Easy to create several scents and the everyone loves how their skin feels afterward. COMMENTS: I used this for a couple of body creams and it was loved by others. I don't no which one I love best between this lotion or the Shea and aloe, but I do know one thing....these butters are amazing!! COMMENTS: I'm very happy with this lotion base. It holds scent, color, and glitter very well. It's even great to use as it is, with nothing added. I'll be getting more of this in the future! "I can't express how much I love this!" COMMENTS: This lotion base is the best thing that's ever happened to my life! It's such a wonderful formula and is super quick absorbing. It makes your skin baby soft. COMMENTS: This product is my 'go-to' choice for all of my lotion needs! My customers LOVE it... I LOVE it! It is easily scented and when used, it leaves no greasy after-feeling! I will be using this for years to come!! Thank you for a superior product! COMMENTS: Planing in using this as my main quick lotion, thank you! COMMENTS: Very popular lotion. My customers love this product. "My favorite of all the thick lotion bases!" COMMENTS: I ordered the sampmer of the thick lotion bases and although they are all great! This one is my favorite! COMMENTS: I love this lotion and so do my customers. COMMENTS: This is by far my favorite lotion base. Makes your skin very smooth, and my customers rave about it. COMMENTS: This lotion base is super thick and rich. I add a little sweet almond oil to thin it a bit along with fragrance and it is ready to sell. Feels lovely on the skin and I use it on my face too. 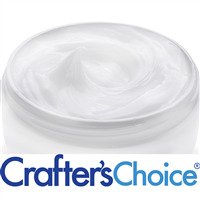 COMMENTS: Love Love Love the Crafters Choice™ Goat Milk & Honey Lotion. My first purchase was exactly what I was looking for and this won't be my last purchase of this product. COMMENTS: I use this for massage. Just add a few drops of essential oils. • Great consistency! Priced right! COMMENTS: i have been using this lotion for years, I mainly use it for friends and family gifts and we all love it! COMMENTS: I made a variety of scented lotions. This product is easy to use, holds scents and colorants well and leaves no greasy residue. Feels great on your skin! COMMENTS: Love this product! Easy to work with. Takes scent well. Everyone who has tried it loves the way it feels! COMMENTS: Saves time and has the perfect consistancy. A very popular lotion. Accepts scent quite well. COMMENTS: I loved that this product is very soothing to skin, and yet never feels greasy. It hydrates thoroughly and is perfect for this winter weather. COMMENTS: This lotion is wonderful. It goes on smooth, is non-greasy and leaves hands ultra soft and moisturized. My customers love it and I can't go without it! Very easy to add scent and color! COMMENTS: I was hesitant to buy this lotion base. So glad I finally did, my customers think it is absolutely wonderful! They love it when I scent it with amber and incense fragrance oil or caramel woods fragrance oil. It sells immediately. "Nice, neutral base, wish it were richer ..."
COMMENTS: Overall a great lotion base, but perhaps because I live in a very dry climate and I wash my hands/shower all the time, I wish it were richer. Right now it is good for the summer months but in winter I need to switch to a thick, more nourishing base. COMMENTS: this is an excellent product to substitute for my own formula when I am pressed for time! It is also the product I recommend to all my training students, because Goat Milk is SO HARD to perserve... This is a safe product that I am comfortable using when I need a GM lotioin and cream base. COMMENTS: This product is great! My customers love it. It goes on smoothly, absorbs quickly and leaves the skin very soft. "Goat Milk & Honey Lotion"
COMMENTS: Love this lotion!! It doesn't feel greasy and is easy to work with. "Have used Goat's Milk & Honey Lotion for Years!" COMMENTS: I have been using WSP's Goat's Milk & Honey for years and will not use another base... it is that good! I love how thick it is and the velvety way it makes your skin feel. My lotions made with this are by far a better sell for me than the lotions I made from scratch. And I don't have to keep many supplies to make lotion anymore, just this base! I do heat mine a little to pour into my bottles and that works great. COMMENTS: My customers love this so much I can't keep enough in stock. "Outstanding base for facial cream"
COMMENTS: This base is a favorite in my lotions, but I also use it to make up face cream. It's quite the hit- it spreads easily, is absorbed wonderfully, and dries to a nice, silky smooth finish. It holds scent very well. I haven't encounter anything but good results with this base so far. COMMENTS: This is a customer favorite (mine also). Product moisturizes skin with no sticky residue. I sell lotion to a doctor and her staff. They love it as they are washing their hands often and the lotion stays through several hand washes. COMMENTS: I bought this based on the reviews and I was not disappointed. This really is a perfect base for a lotion! It is medium weight and gives just the right amount of moisture to the skin. I used the Boston 8oz bottles with black saddle pump and keep a bottle of this by the sink and at my desk. No more excuse for dry skin! COMMENTS: This lotion is amazing. It's light in texture but don't let that fool you. The moisturizing properties make this a keeper. It goes on as smooth as silk and stays that way. Also holds fragrance oils very well. I put 2 oz. jars in the womens gift bag at our Ladies Retreat. Everyone raved about it. I will definitely use this in my line. Try it. You won't be sorry. COMMENTS: working with this lotion is fun and easy! My customers love it and I do too! I made up a few samples bottles and now I'm hooked on it! I use the Goat Milk and Honey fragrance oil with it and I can't keep it in stock! COMMENTS: I've been using Goat Milk and Honey Lotion for years and my customers love it! Makes your skin silky smooth and no greasy residue. COMMENTS: Super easy to use. Takes scent and color well. Customers love the way it feels going on and how it leaves their skin feeling. Another terrific product. Highly recommended. "Will buy this product again!" COMMENTS: Awesome! Can't say enough! "This is a must carry product in my shop"
COMMENTS: I've been carrying this product for years and if I even hinted at discontinuing it, I'd have a buyers riot on my hands. It is my lightest lotion, it goes on smooth as silk, hold scent really well and just feels so very high quality on your skin. COMMENTS: This lotion is so amazing and versatile! The perfect base for soothing additives! "This is by far my favorite lotion base so far!" COMMENTS: This lotion has a great and fresh texture, non greasy and takes fragrance beautifully. I would compare it to a lighter, high end whipped body butter. Customers love it with Black amber and lavender fragrance and I have begun using it myself for its skin softening properties. "Oh my gosh! This lotion is heavenly!" COMMENTS: I purchased this lotion to use for a quick soap and lotion fundraiser for a non profit organization. This lotion has been a HUGE hit! So far we have used this lotion with Under the Stars FO, Cucumber Mint FO, and Peppermint Cream FO. All sold out within the first three days of our fundraiser launch and I have repeat orders and preorders for more! Everyone is commenting how it's non greasy, smells amazing, and leaves their skin feeling silky soft I have used the peppermint Cream version and it is amazing! I highly recommend! • Easy to use and quick to make. COMMENTS: Accepts fragrance well and leaves skin very soft. A little goes a long way!! Customers LOVE IT!! COMMENTS: Love this product. Glides on nicely and feels silky smooth! COMMENTS: Smooth & Silky is the feedback I am receiving from my new customers about this lotion. The goatsmilk base was requested by some of my new customers so I decided to try it and I am picking up more and more orders for this amazing lotion. A little goes a long way! I add Pure Lavender Essential Oil and other natural ingredients to this lotion base and it does amazing. It holds the Lavender fragrance very well and a little goes a long way! COMMENTS: My customers love this lotion! They keep coming back to buy this for either themselves or their friends! Kept asking me when stock is coming in. Our shop is in Hong Kong and I pay expensive shipping charges (the shipping is more expensive then this product itself), but it is so popular I have not choice but to keep coming back for stock! COMMENTS: Regardless of the Fragrance or Essential oil blend we add to it our customers love this Lotion, we will continue to use it in our line up. It leaves your skin feeling hydrated. COMMENTS: This base is really easy to use and a good quick way to make a bunch of lotions with not a lot of work involved. I also like the way it feels. I will definitely buy again. COMMENTS: This Goat's Milk & Honey Lotion Base is an excellent product! It's wonderful all by itself or with some of my own additives it makes a premium lotion that goes on smooth not greasy or sticky. It leaves your skin feeling powdery soft and smooth. I've tried bases elsewhere but this is the best! "I Can't keep it stocked!" COMMENTS: I can sit on the same sugar scrubs and bars of soaps for weeks but make 30 bottles of this lotion and it is GONE in a day or 2!!!! I sell one bottle and i get contacted the next day when they want to get 2, 3 or 4 more. If you buy this, you will not regret it!!!! It is so very easy to heat, scent, color and pour. It is ready to go out the door. COMMENTS: This base is so luxurious. People love it and it is so easy to work with. My hands feel so good after using this lotion. COMMENTS: The only thing I do to this lotion is scent it. My customers love it! COMMENTS: I bought this to try to build a body line for "those" customers who don't use candles. Well I tried it and I LOVE IT! I even took samples to work and the girls and the only guy love it too. It goes on smooth and absorbes in pretty quickly. Using it daily got rid of the dry patch on my elbow that nothing else would touch. I haven't tried mixing it with scents. The girls and I like it unscented so it won't mess with our body sprays. Will be added to my body line up for sure. The word spread quickly at work and everyone wants it. COMMENTS: This lotion base is so creamy and smooth. It mixes well with my essential oils and leaves the skin feeling silky smooth. I am buying again! COMMENTS: I bought a small sample of this lotion and love it! Wanted to buy more when it was on sale, but had to be sure some of my (unrelated) medical issues didn't cause me to quit making lotions. All is good now, can't wait for another sale to buy a larger container! It is smooth and absorbs well. I can't wait to experiment with adding other oils or butters to make it "my own". COMMENTS: This is a must have in any product line or for homemade Christmas or birthday gifts. So many great benefits of this lotion including the ease of going on, no greasy feeling, leaves skin baby soft and very nourishing. I add a little fun by adding a little color and different scents along with a fun name and voilà perfect and ready to go with all the jars ready to fill and deliver. Excellent product! COMMENTS: I had stressed over which lotion to buy. I'm so glad I bought this one. It moisturizes and accepts fragrance and other additives well. I will be a repeat customer. I do wish the gallon was a little easier to open, but it is worth it. COMMENTS: I have used this base for years and have a very happy customers. Takes fragrance and dye very well and I hope you never get rid of it or change it. COMMENTS: This was my first time purchasing a base lotion. It accepts fragrance very well and I'm excited to try the silky lotion next. Thanks! COMMENTS: We sell so much of this lotion! We give out samples using popcicle sticks at craft shows and the majority of customers buy it and we sell addition products because of it. Seriously, try this lotion; its amazing! COMMENTS: Love it. Smells great with Goats milk and Honey FO. Took to my first craft fair and people seem to really like it so I ordered more!! I am very happy with this base. The only thing I added was the FO. "Don't bother making your own... this is better!" COMMENTS: So I made a batch of my own, then ordered a sample of this. No contest. And this is more economical for me! win win. "Luxurient feel. Not greasy, great staying power. " COMMENTS: I love this base. I use as is with fragrance or essential oils. I have sold many bottles of this lotion with many return customers. Did very well in small 2 ounce malibu tubes with various fragrances/essential oil blends. Selling in small tubes with many varieties gave me a very high profit point and gave my customers a big reason to come back and order more. Big hit with tweens and Moms for stocking stuffers. Warm slightly to add fragrance and to make it easier to pour. COMMENTS: Light, Smooth, Creamy, Non-Greasy, Takes Scent, Color and Oils well. This base has the most amazing, creamy texture. Customers love it! "Love this lotion base "
COMMENTS: This base made it very easy for me to add fragrance and other ingredients to make it my own. COMMENTS: Absolutely love this! I bought the 16oz jar to try it first & ended up coming back for the gallon bucket. I saved the 16oz jar for myself & made 2 different creams from it. I find myself using it a few times a day on my hands simply because I love the way it feels & it holds scent & color really well. Also use it as a body cream & it's amazing! You only need a small amount at a time, "a dab will do ya". It leaves a softness with a powder feel. I know my customers are gonna love this one! I definitely think of it more as a cream though than a lotion because it's thick. This is a keeper! COMMENTS: Ok, so I usually buy the lotion base with evening primrose which I LOVE, but wanted to try something different. The Silk and Satin lotion was out of stock so I decided on the Goat's Milk & Honey. The ONLY think I don't like it trying to get the darn lid off. I understand it is too think for a jug but the jug w/ pump is SO much easier. Other than that (and having to heat up the lotion to be able to get it in the bottle) I LOVE the feel of this lotion so much! COMMENTS: I didn't really like this lotion, and there are way too many chemicals in it. I was disappointed and wouldn't order it again. COMMENTS: one of our favorite products skin softening, non greasy, no strong or bad smell, just perfection in a jug. has added so much to our product line so easy to use it's just wonderful - can't say enough good about it I include just a couple of additives and this stuff flies off the shelf. Hubby loves it, swears by it and unnecessarily pushes it at the shows - his fave product! I can add color and wonderful WSP fragrance, put it in a jar w/ a lovely label and the ladies think they've hit the jackpot. It can be a stand alone product - add nothing to it and your customers will love it. So happy to have found this - thanks WSP. COMMENTS: Nice creamy lotion without being greasy. Accepts scents nicely. COMMENTS: This is a great base for lotion. I add fragrance oil . Great for skin moisturizer. I will buy this again. COMMENTS: Love this lotion. It's so moisturizing and has a neutral fragrance. COMMENTS: My Customers love this cream and so do I! Will be getting much more! COMMENTS: Love this lotion base! Saves me so much time from making the lotion from scratch and still offers the same moisturizing as handmade lotion. COMMENTS: I absolutely love this lotion base! It takes fragrance oils perfectly. This base is thick enough to hydrate and nourish skin. Everyone I have made this for has loved it! It is too thick to put in a bottle so I use jars. I will not use any other base for my products!! COMMENTS: I absolutely love this base, it feels so good and absorbs nicely into the skin! This is #1 on my list of lotion bases I have purchased. "Milk Goat & Honey Lotion"
COMMENTS: I love this lotion! It is my best seller. I have customers buying 5 jars at a time! It is light and doesn't leave a greasy feel on your skin! Once I have people try a sample they are hooked! It is also very easy to put together. "Goat milk is all the rage"
COMMENTS: here, and my retailers' customers are buying this like crazy. Easy to scent and bottle, I will be keeping this in my product line. The buckets are handy, too! COMMENTS: Finally got around to trying this lotion base and I absolutely love it. Leaves the skin silky soft and not at all greasy! Will definitely be buying more. Customers love it. Love it scented and unscented. COMMENTS: I just love this lotion base for winter. Not to thick but still moisturizes beautifully. It takes fragrance well and is a best seller. COMMENTS: Out of the Lotion Sample Kit I ordered I will say this is my favorite. Also my daughters, she quickly confiscated it and decided it was hers. That's ok I would highly recommend this lotion as a great one to add to your line, I don't think you'll be disappointed. Its very affordable as well.